Just over 250 million years ago Table Mountain was part of the ocean bed off the coast of what was to become South Africa. Forces from an underground volcano sent magma rushing to the surface of the volatile earth and as the magma pushed upwards it lifted the sand and mud of the ocean bed out of the sea and raised it 1085 metres into the air to form the mountain that we have today. It is said that the mountain is still rising out of the sea but its height stays constant due to water and wind and chemical erosion taking place. If you look at the make up and geology of the mountain the base of it is granite mixed with shale. What is granite? It is cooled down magma from a volcano and here in Cape Town as you travel around the Cape Peninsula you will find many granite boulders either on the mountain slopes or in the ocean left over from the forces that formed the mountain. 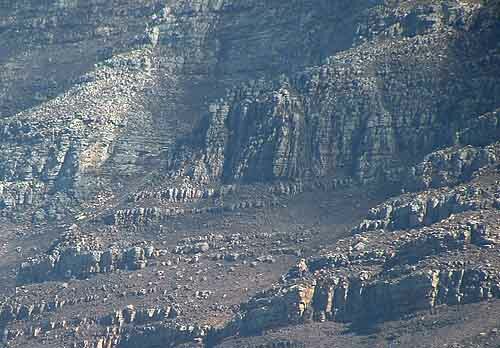 The geology of Table Mountain is interesting in that it has three or four types of rock making up its structural base. 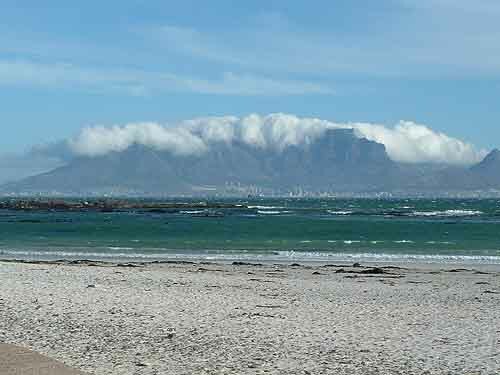 The upper part consists of Ordovician quartzitic also known as Table Mountain Sandstone. This part of the mountain erodes very slowly and when it does forms the characteristic steep grey crags the mountain is known for. Below the sandstone is a layer of micaceous basal shale which erodes quickly and is not readily visible. when looking at the mountain. The base of the mountain consists of folded precambrian Malmesbury shale, which is mixed with Cape Granite and weathers more slowly than micaceous basal shale which makes up the middle layers of the mountain. As you can see the mountain has a very interesting geological makeup which even Darwin found interesting when he visited Cape Town all those years ago. About 15000 years ago the mountain was an island, in fact one of two islands, a northern island and a southern island and could have been about 50 kilometres from the mainland which would have been around the base of the Hottentots Holland mountains near Paarl depending on the depth of the ocean at the time. Once the ice age started the sea levels dropped and the sea channel between the mountains to the east and the Table Mountain island dried up. 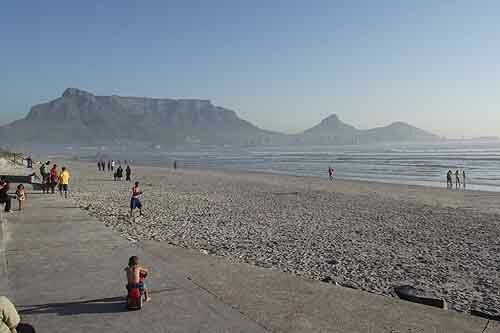 The land which had previously been underwater and formed the bed of the sea channel became dry land with a sandy floor which is today known as the Cape Flats. 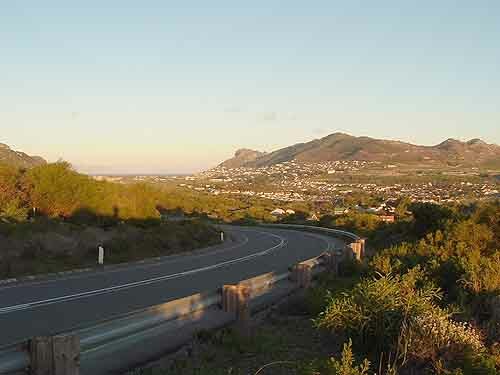 The sea channel between the north and south islands also dried up as the sea water receded and the two islands became what is known today as the Cape Peninsula connected by a low level land bridge in the Fish Hoek valley. From the early 1400's seafarers started visiting the Cape looking for water and one or two ships captains anchored in Table bay. 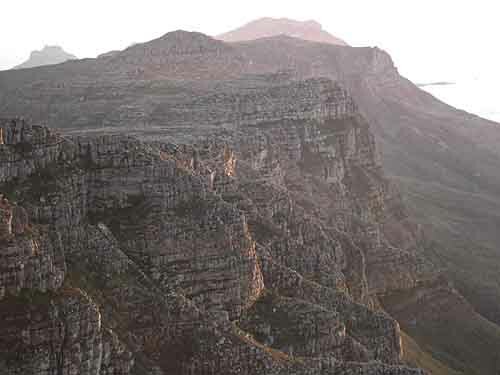 One ship's captain Antonio de Saldanha is the first person recorded as having climbed Table Mountain when he climbed the mountain by way of the Platteklip Gorge way back in the early 1500's. This popular route up the mountain is still used today. He must have had quite a difficult climb as in those days there would not have been a pathway to the top as there is today. The Castle built by the Dutch in 1662. Waves once broke against its ramparts near the top of the photo. 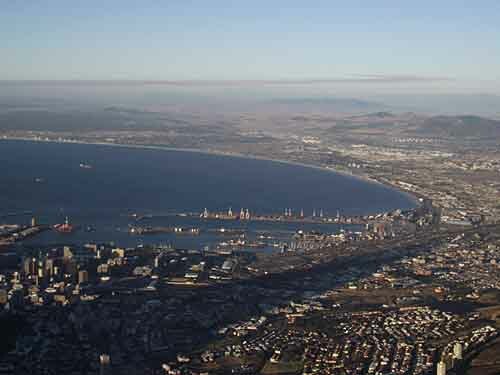 Once the Dutch arrived in the Cape in 1652 to start a refreshment station many hundreds of ships arrived in Table Bay looking for food and fresh water. Soon the streams running off the mountain became the main water supply of the new settlement. In the early 1900's as the city grew Table Mountain's streams could no longer supply the city with water so it was decided to build a number of dams on the top of the mountain.To build these dams building supplies were needed on top but getting them there was a major problem to the contractors. They solved the problem by building a cable way to lift supplies to the top of the mountain. 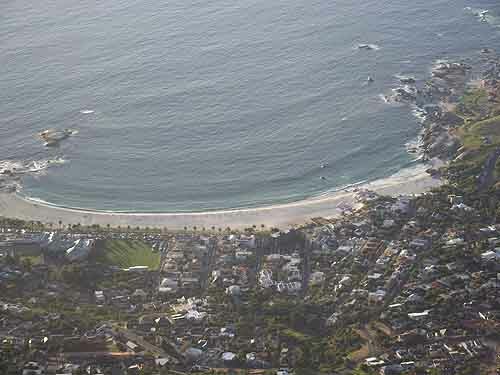 This was the first cable way ever built on the mountain and it ran from the hillside above Camps Bay to the top near where the upper cable station is today. Once the dams were completed there was no further use for the cableway so it was dismantled. This however did not stop people wanting to get to the top of the mountain although only a few of our forefathers actually climbed to the top. By the 1870's the attraction of the mountain got so strong that residents of the Cape started suggesting that a railway line should be built to the top. Plans to build a line were put forward but before they could be implemented the Anglo Boer War broke out and the plans were shelved. The urge to get to the top of the mountain never waned and in 1912 the Cape Town City Council decided to commission an engineer to investigate various options of transport to the top. Mr H.M. Peter the engineer tasked with the investigation suggested that a funicular railway running from Oranjezicht up through Platteklip gorge to the top would be the most suitable option. A vote was taken and the vast majority of Capetonians of the time voted in favour of the funicular in spite of the 100000 pound price tag. What an eyesore this would have created on the mountain had it been built. 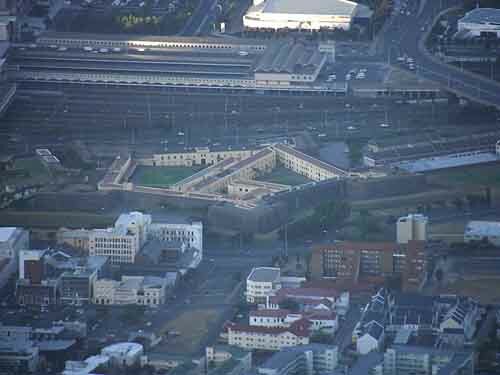 Fortunately for Cape Town the first world war broke out and the project was delayed indefinitely. After the war the plan to get to the top of the mountain was resuscitated and eventually in 1926 a Norwegian engineer Trygve Stromsoe presented plans for a cable way to be built to the top. 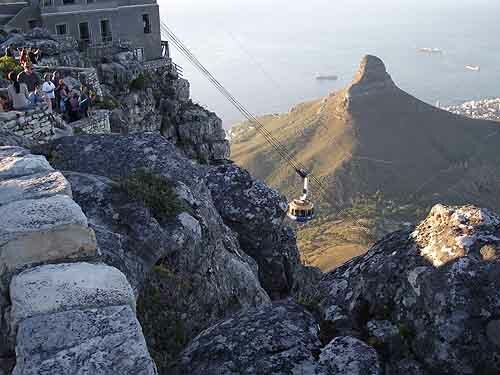 Local eminent businessmen liked the idea of the cable car and an easy ride to the top so they got together and formed the Table Mountain Aerial Cableway Company (TMACC) to finance the construction. There was no dragging of feet on this project and on the 4th of October 1929 a ceremony led by the then mayor of Cape Town the Rev A J S Lewis was held to officialy open the cable car. Two hundred guests attended the ceremony. Since 1929 over 16 miilion people have taken the cable car to the top of the mountain and these people have included the likes of King George VI and Queen Elizabeth II, as well as Oprah Winfrey, Prince Andrew and Micheal Schumacher to name a few. In 1993 there was a upheaval in the TMACC when Dennis Hennessy, the son of one of the founders sold the company. 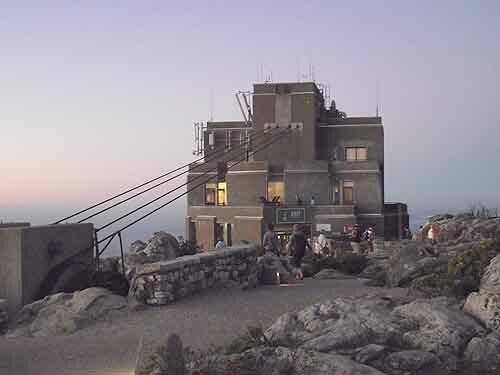 With the take over by the new directors an upgrade of the whole setup of the Table Mountain experience was planned. Infrastructure such as the restaurants, cable stationswere refurbished and new cable cars were purchased. The new cars called Rotairs were drastically different from what was used prior to the upgrade. The old cars were rectangular and could only take 25 passengers while the new cars are round with a rotating floor which gives the 65 passengers a 360 degree view of the surroundings as it makes its way to the top of the mountain. 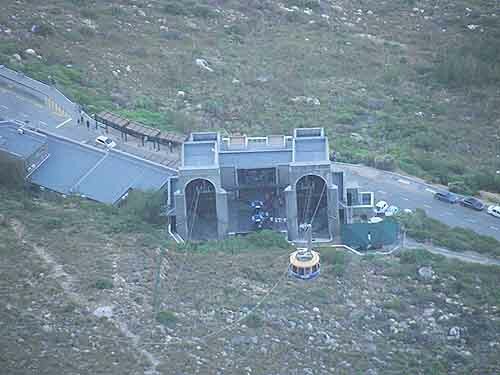 Work on this upgrade began in January of 1997 and the new cableway was officially opened on the 4th of October 1997, on the anniversary of the original launch, almost 70 years previously. What a difference the upgrade has made, queues are still long to get tickets but people don't have to wait as long as they used to to get to the top. So what is the attraction to get to the top of Table Mountain? The mountain forms part of the Table Mountain National Park which runs all the way from the city to Cape Point. It is one of only a few parks in the world that only has three points of entry where payment is required. All other access to the park is free. A second unique feature is that Cape Town and Table mountain form part of the Cape Floral Kingdom, one of the smallest floral kingdoms on the earth but with the highest diversity of plant life The entire park has in excess of 7500 unique and endemic plants growing within its boundaries while Table Mountain alone has approximately 1470 species of plants growing on its slopes.. Many of them appearing nowhere else on earth. 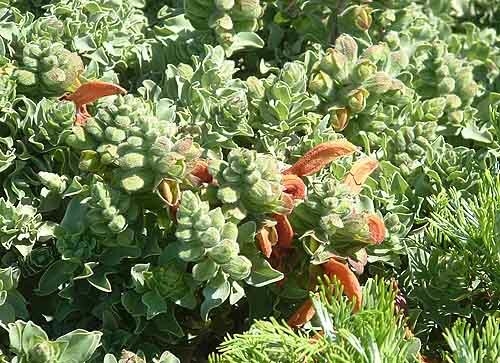 Included is this diversity is the rare Silver Tree which grows wild on the slopes of Lions Head and the wild orchid Disa Uniflora. 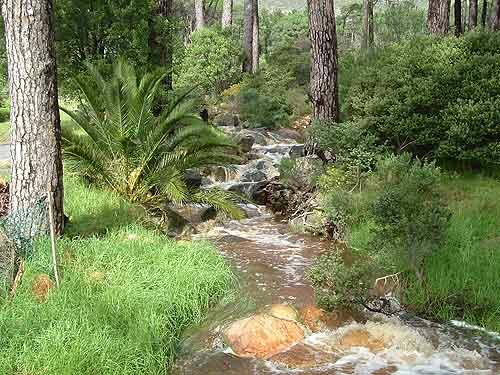 The Mountain Park is recognised globally for not only its extraordinarily rich, diverse and unique fauna and flora but also for its rugged cliffs, steep slopes and sandy flats. What a sight the Twelve Apostles range make from down below but from the top of the mountain they are even more impressive. Who will forget the table cloth which forms on the mountain in the summer months when the strong south east winds blow and which can change a hot summers day on the mountain into a winters nightmare in a matter of minutes. The most remarkable fact of everything set out above is that the mountain, Table Mountain National Park, the cable car and the spectacular views are only a 10 minute bus or taxi ride from the city centre. Where in the world will you find something this spectacular, this close to nature, and this close to the city. For those visiting Cape Town in the near future the cost of the trip up Table Mountain is a mere ZAR 180.00 per adult (In USD terms a mere $20.50 at current exchange rates). How can you not take the time to visit our mountain? ps. 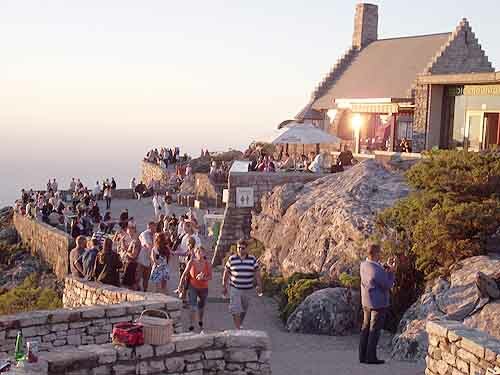 The prices quoted above change annually so please check for the latest prices on the official Table mountain website. We look forward ton seeing you there.